For the past several years, researchers have been working to develop a trap that may be able to harvest lionfish from deep water. 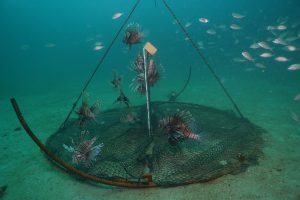 Dr. Steve Gittings, Chief Scientist for the Office of National Marine Sanctuaries at the National Oceanic and Atmospheric Administration, has spearheaded the design for a “non-containment” lionfish trap. The design works to “bait” lionfish by offering a structure that attracts them. The trap remains open while deployed on the sea floor, allowing fish to move in and out of the trap footprint. When the trap is retrieved, a netting is pulled up around the fish inside and they are brought to the surface. design and assess how deployment and retrieval methods may increase their effectiveness. 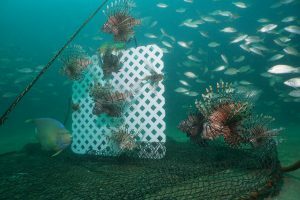 If successful in testing, lionfish traps may become permitted for use by commercial and recreational fisherman. The traps could become a key tool in our quest to control this invasive species and may even generate income while protecting the deepwater environment. What is the attraction to the latticework, and how was it discovered? Lionfish are attracted to structure and the lattice acts as structure. Earlier prototypes were bulkier and weren’t able to be stacked (more room on the boat) like the current design is. The lattice is 2D so can be easily closed within the trap. This was mostly figured out through iterative design ideas and trials by Steve Gittings. So glad UF is taking the lead in trying to find ways to reduce lion fish population. If there is no form of control then the fishing industry is doomed. I would support the federal government subsedizing fisherman to harvest lion fish to make it profitable to them.. Then we can make a dent in this distructive fish. So Any preliminary results on the test trial?